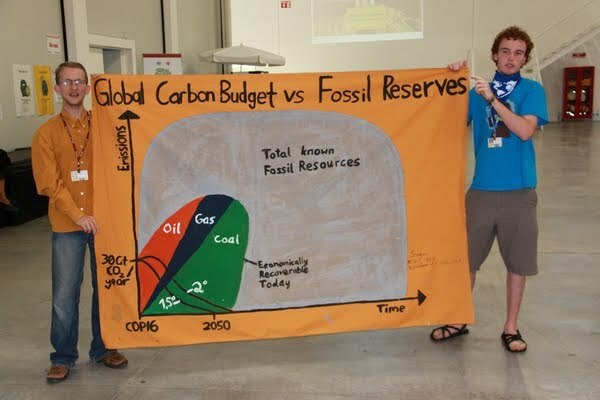 There is no way we could extract all fossil fuel reserves if we want to solve the climate crisis. We are not yet on track for solving it and this topic has not yet been addressed in public discourse or even in the scientific literature. We from the YOUNGO Zero Emissions Working Group did an action at COP16 in Cancun to draw attention to the topic so that it will eventually find its way onto the UNFCCC agenda. Some issues we are wondering about…..
How big is the global emissions budget to 2050 and how are we going to SHARE it? The answer to that question cannot be delayed any longer. We are sorry for countries that feel unprepared for the inevitable consequence of this discussion: drastic cuts in over consuming countries (OCCs formerly known as “developed” countries, defining any country that has high per capita emissions) are necessary. For sharing the global budget, a per capita approach is the hottest candidate for making the race, with historical responsibility surely needing to be included. Every country needs to create a zero emissions plan. Zero emissions is not a question of “yes or no”, it is simply a question of “when”. 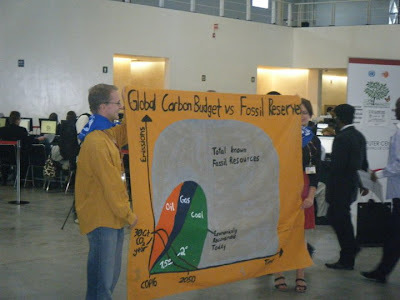 This question should be answered by each country and the UNFCCC should structure and facilitate that process. Obviously Annex I countries have to get to zero emissions much sooner than Non-Annex I countries. Some countries have already announced zero emissions targets. Who will be the next Zero Hero? How many fossil reserves do we have? What part of it are we going to extract and what part of it are we going to leave in the ground? This discussion is strangely completely absent from the UNFCCC and lets us worry about how serious everyone is about de-carbonizing the economy. 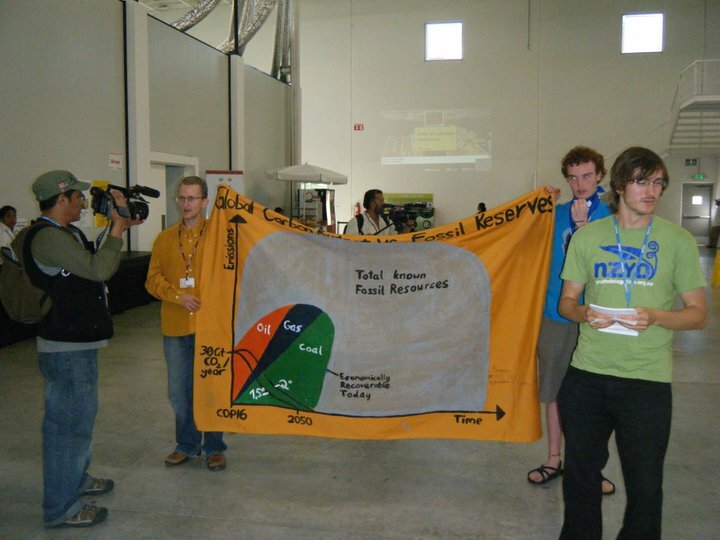 We need to face the facts about how much fossil reserves we have and then talk about how to phase out extraction. By the way, who the ***** is still subsidizing fossil fuels at 390ppm? These are the REAL issues that need to be talked about in Cancun. Are you actually here to solve the climate crisis? This way of looking at the climate crisis is naturally expanding. The report "Unburnable Carbon" http://www.carbontracker.org/carbonbubble shows how investors are fooled into betting their money on companies that will never be able to extract that much oil, gas and coal.